Elder Scrolls Online, Housing Decoration was implemented with Player Housing in February 2017. 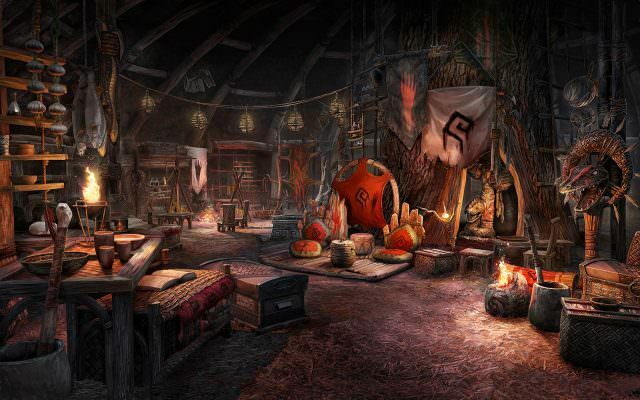 No two player-decorated home interiors will be identical in Homestead. You can put your own personal touch on every home you own by crafting or buying furniture and decorations, and you can place them wherever you like with the game's new Housing Editor. Some homes even have outdoor spaces that you can decorate! Let your imagination run free and create a place to call your own like no other in Tamriel. You are able to craft or buy new furniture and decorations for your house and can use the housing editor to move them all around. Some homes feature outdoor real estate that can be further customized. There are over 10,000 decorative items running the range from tables and chairs to books and plants. You can fill your home with furnishings that include (but are not limited to) tables and chairs, chests, armoires, beds, bars, and counters. Once your furniture is in place, you can put the finishing touches on your home with decorative items such as books, food, barrels, paintings, light fixtures, plants, trees, and more. The possibilities are limitless. Depending on the home you own you can only have a max of 750 items in the home at any given time. With special categories for trophies, pets, and mounts. The cheaper and smaller the home the less items you can have. The lowest however is 30 items without ESO plus. Find a complete list of all Achievement Furnishing Items here. Buying them in the Crown Store. Once you obtain a decoration, you can use the housing editor to move them all around. Some homes will feature outdoor real estate that can be further customized. You will also be able to grant trusted friends permission to decorate existing placed items in your home (they cannot add or remove items from your home), and allow those who are not on your friends list or in your guilds to visit and/or decorate your home by adding them as a “Visitor” or “Decorator” in your House Settings. Furniture Crafting is also another announced feature. It will enable players to create their own custom furnishings for their dwellings, presumably with usage of regular crafting materials and special motifs for styles. Available since Dragon Bones DLC. You can purchase storage coffers and chests from the Mastercraft Mediator, the Crown Store, or from Tel Var Merchants. You can also earn a storage coffer from the Level Up Advisor (detailed below) upon reaching level 18, if you have not already purchased it. It would be interesting if you allowed house "visitor" or "decorator" to have access to your chests. How about a "chest" permission so I can have friends pick through some of my excess and very improved equipment? Is it possible to store inventory items( given that items binding-on-use being an exception), such as apparel, weapons, food... Will this also extend to allow transfer of plus-membership storage, especially if cancelled? Will this also allow siege-weaponry storage in larger housing? Can you put laundered items in your home??? If someone bought a house furnished can they sell the furniture that came with the purchase? Your instructions would be more helpful if it included instructions on how to enter the housing editor once you&apos;re in your home.